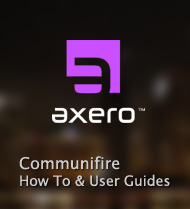 Your intranet is private by default and members use their Communifire account to login by default. When your intranet is private, users that are not logged in will see a page where they can login with a username, email, or any Single Sign On (SSO) options that are enabled. Visitors also have the option to register for an account or reset their password. When your intranet is public, users that are not logged in will see your homepage and all public spaces. You can easily control which content visitors can view using permissions. Check or uncheck Guest permissions in Control Panel > Content for top level content and in Manage Space for space content. To make your intranet public, go to Control Panel > System > General Settings > Site Settings > Allow access only to registered members. You can set the maximum number of invalid login attempts allowed before an account is locked. Go to Control Panel > System > System Properties and search for MaxInvalidLoginAttempts. To unlock an account, click Forgot Password . An administrator can also reset a user's password in Control Panel > People > Manage People .